To do a double flight of instruction you do not need to have experience, just have the will. Our instructor is the one who pilots the equipment, you go for a ride. Before the flight, the pilot passes the basic instructions to the student on the take-off procedure, both connected in the respective selections. Still on the ground, they simulate the run for takeoff and the pilot explains how the student should proceed to settle in the selection after taking off. And what follows are magical moments! You will see things from a privileged angle: from above! Flying at approximately 1,500m of sea level, you will have the opportunity to see several cities and fly by the clouds. Practical classes comprise two levels of learning. 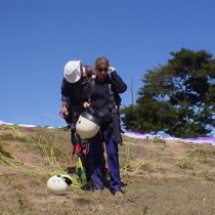 The first level and over control, take-offs and landings recognition of the equipment. The flights are carried out in class lessons. 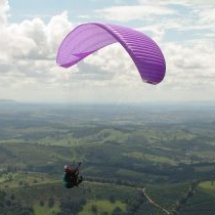 The second level covers control in altitude and cross country flights in Cambuquira. 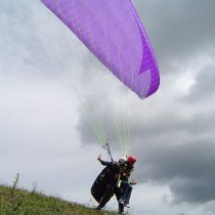 Created by French climbers who wanted to find a faster way to go down the mountains, the paragliding or paragliding presents safety in the fleet and practicality in transport, easy to learn and take off from mountain or hill. The objectives is to achieve great distances with long stay of flew. 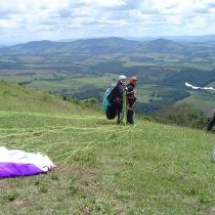 The course aims to initiate students in the activities and approaches safety techniques and standards to future pilots, who can enjoy all the pleasures this sport provides, even when practiced alone, or when integrated with other sports such as hiking, mountain climbing, mountain Bike, among others.